First off let’s look at the episode title “The Darkness and the Light”, which at first glance is pretty self explanatory considering the villain of this episode is “Dr Light” AND she causes Barry to go blind for a significant portion of the episode. Though there is actually more to this episode in terms of “darkness and light” as it pertains to good and bad/ known and unknown. We already known that when Barry first meets Dr Light he is surprised to learn that she is actually the dark Earth 2 version of Linda Park. This also pertains to Barry’s new uplifting relationship with Patty despite other things in his life seeming kind of dark. Though the true light and dark parallel of this episode is also paired with the other meaning of ‘darkness and light’ – the unknown vs the known – and that of course is the appearance of Earth 2 Wells. On one hand, he is the mirror of the man who killed Barry’s mom and made all their lives hell last season. So what are the odds that both are evil. Then again, it was actually Eobard Thawne and not Wells who did all those things. So this could be the honest evil twin of Wells. What are we supposed to believe? Well Team Flash has the same exact problem and it’s complicated even more by Jay Garrick who is certain that Well’s has an ulterior motive as he’s always tried to profit from metahumans. Is there a dark reason Wells is now accepting responsibility for what happened and wants to stop Zoom? Considering he’s listening to “you’re not good” when Cisco enters, we could take a guess, although the post credits of the episode reveals his true motivations. This Wells is good and the thing that changed those months ago is that Zoom is holding his daughter captive. Why and for what purpose we don’t know; but it does seem safe to say that this Wells can be trusted to be on the side of good. But will his hasty attitude cause more problems than they’d fix? This is of course a Killer Frost hint; but what way can we take it. For starters, we can of course take it to support our initial theory that Killer Frost will begin as Earth 2 Caitlin. This episode we saw how much of an effect seeing a secondary character (Linda Park) as an Earth 2 villain had. So imagine how much bigger it’d be if we eventually met Earth 2 Caitlin and she turned out to be another envoy of Zoom? The idea of central character being different in Earth 2 has already begun and there’s no telling where it can end – but I’ll get to that in a moment. For now, let’s just remember that Potential Meaning #1 of Caitlin’s quote is that no one at that table in THIS universe would be bad; and whether or not THIS Caitlin did get powers of her own is besides the point as she could become a good ice based hero – such as Ice. Potential Meaning #2 is of course a lot more tragic and says that someone at that table IS going to become a villain when they get powers. Barry and Cisco already have theirs, which means Caitlin would eventually get hers in a new accident. But how and why would she turn? Well this next part is PURE theory on my end; but if this Caitlin is meant to get powers and become bad, her turn could be related to her budding romance with Jay. What if in the coming battle against Zoom, Barry and the others drastically underestimate Zoom, and Caitlin not only gets powers but Jay is killed trying to save someone. First Ronnie died and now Jay because of what they were doing. Sure Caitlin said she wasn’t made at Barry in the season premier; but the onset of powers while losing someone else she loved could make her snap – *tries not to make a cold snap joke*. This theory is pretty out there; BUT if the writers do go the route of making our Earth 1 Caitlin Killer Frost, this is one possible way they can make the villainous change happen. Though I think we’d all agree Potential Meaning #1 (Earth 2 Cailtin Snow) is much more likely and preferable. But what if this divisive quote from Caitlin had one more meaning – one that could pertain to Barry. Sticking with Potential Meaning #1 of that Caitlin quote – and the evil Linda Park doggleganger – we can also see this as further support as Zoom actually being an evil version of Earth 2 Barry, from the future perhaps. We could guess that is how Zoom knew BUT WAIT… that doesn’t make sense. Earth 2 Wells (aka Harry) made note of how much of Earth 1 Well’s life was different. Did he mean that generally or because Earth 1 Wells diverged very different due to Eobard’s presence. As much as I LOVE the idea of Barry having to face off against an evil version of him – like the Future Flash story line – this episode might have just given us our first hint at an alternative Zoom. With Earth 1 and Earth 2 having different histories, IF sending Dr Light was a purposeful move by Zoom – again her identity could just be a total coincidence – then that would mean Zoom would need extensive knowledge of Earth 1. Garrick then mentioned that Zoom wanted to be the only speedster in the multiverse. Who could possibly know about Earth 1 Barry’s life as well as know about the presence of breaks between universes. 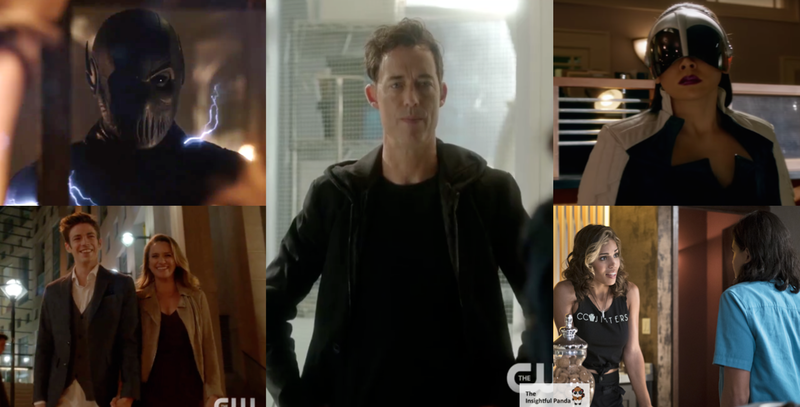 An early theory reemerges as Eddie Thawne – last seen being sucked into the singularity wormhole – once again becomes a likely candidate for Zoom. What if Eddie somehow got a second life between dimensions? Being constantly torn between worlds and all of time could warp anyone’s mind bad enough. There is a character in the comics of course named Zoom (aka Hunter Zolomon) who was lost in time and thus this misplacement gave the illusion of super speed. But seeing as how Reverse Flash last season took creative liberties, Zoom’s story could be changed up as well. In the comics, Zoom did all his horrible acts to make Wally West a better hero. In the comics though there is another character who purposefully hunts down those touched by the Speed Force. He even had a black suit; but his name is Daniel West… the brother of Iris West … Woah, we might have just bit off more than we can chew here. Perhaps Earth 2 Iris had a brother Daniel; because as far as Earth 1 goes, Iris’s brother has already been confirmed as Wally West. The episode begins 2 months before the end of the Season 1 Finale. If you’re having any trouble keeping up, here’s a handy little infograph. It seems like we’ve finally learned why the Earth 2 Metas sent by Zoom go after their Earth 1 counterparts, to hide from Zoom and assume their Earth 1 identity. Atlantis? Did Jay just drop an Aquaman reference? If he exists in Earth 2 does he also have an Earth 1 counterpart? We are slowly assembling the Justice League so why not. DARN IT Dr Light, Jay and Caitlin were finally going to kiss and you ruined it! In the flashback, Jay says Wells has to admit his mistake before they can work together. Wells on the other hand says Jay has to admit that he himself has failed as well and has been running. 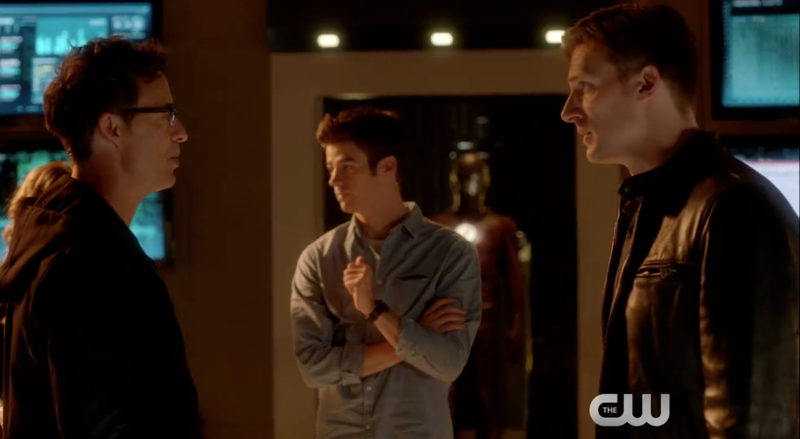 So it was a nice touch that Jay and Wells finally work together to help Barry defeat Light only after Wells admits to his wrongdoings and Jay admits that he was running. It seems like next week Team Flash will use Dr Light to stage a battle with the Flash in order to lure Zoom in. But will Team Flash bite off more than they can chew? Considering we’re about halfway through the Fall Season, it’s safe to say this next battle won’t end well and they’ll be even more set up for the ¾ of a Second Season remaining. So come back next week as Zoom enters in … “Enter Zoom”.